Cambridge Memorial Hospital is a full service, acute care hospital committed to providing exceptional health care to the communities of Cambridge, North Dumfries and the region of Waterloo. Our mission is to be a progressive acute care hospital and teaching facility committed to quality and integrated patient centered care. We employ 1100 staff, 280 physicians and over 400 volunteers. To learn more about our programs and services, please visit the Programs and Services area of the website. If you are interested in joining our team of exceptional people, please visit our Careers area. If you are a patient or visitor, we encourage you to provide us with feedback. Complimentary or constructive feedback may be shared with Patient Relations. CMH's future is very bright. In the fall of 2014, it will begin a complete transformation that will result in a completely new hospital, along with expanded services. When it is finished 5 to 6 years later, it will be the most modern hospital in the region. This transformation includes a larger Emergency Department and a 33% increase in beds to accomodate expanded mental health, medicine, surgery, birthing programs and so much more. To learn more about this exciting project, please visit the TransformationCMH page. 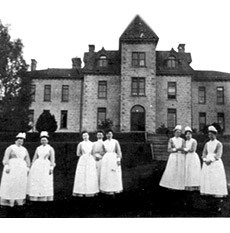 Cambridge Memorial Hospital traces its roots to 1888, when the region’s first community hospital, known as Galt Hospital, opened its doors to treat patients in a localized health care setting. Sixty-five years later, in 1953, a facility was built in its present location which was better suited to serve the major communities of Galt, Hespeler, Preston and the Township of North Dumfries. The hospital was named South Waterloo Memorial Hospital, in honour of those who gave their lives for the community and country. As local boundaries changed and communities merged to become the City of Cambridge, the hospital adopted the new name of Cambridge Memorial Hospital. The last major expansion of the hospital was in the early 1970's when the existing B Wing inpatient tower was built.